The Acer S1385WHne combines portability and output brightness to serve primarily on-the-go business operators. And even though it’s super affordable, starting around $750, the projector performs extremely well. 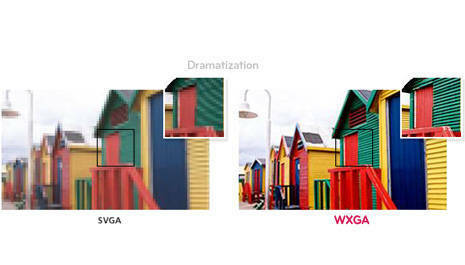 The images are cast in native WXGA resolution and the projector delivers 3,200 lumens of estimated brightness. It works best in small- to mid-sized venues. Of course, with its sub-$1,000 price tag, the S1385WHne isn’t equipped with a long list of features, but even so, it’s not a complete bare-bones piece of hardware. First, it’s equipped with dual HDMI ports – which are very useful for business presenters. Plus, its short-throw lens works well even in cramped venues. 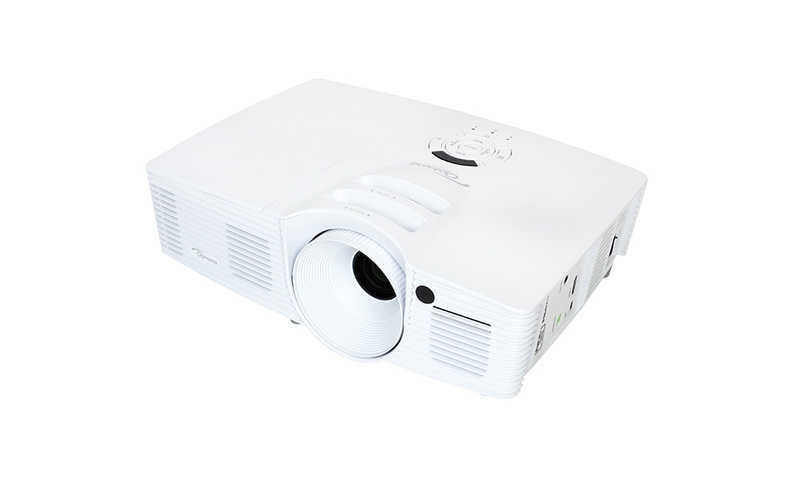 Bottom line, if you’re looking for a budget-friendly projector that gets the job done, the S1385WHne is well-positioned for PowerPoint presentations and occasional video. Above-Average Brightness: At 3,200 lumens of brightness, the Acer competes above competitors in the price range, as the average hovers around 2,500-3,000 lumens. Because of the output, the projector is better-suited for larger venues, especially those with more amounts of ambient light. In darkened spaces, the projector can handle 250+ inch screens, but in a venue with moderate ambient light, the projector would work best with about a 100- to 150-inch screen. 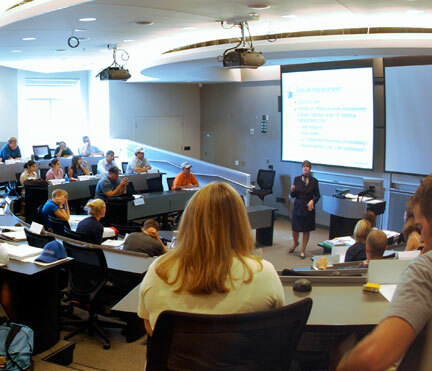 The projector is DLP-based, and as such, full color images aren’t as bright as black-and-white, but the diminished quality isn’t noticeable on average-sized screens. Additionally, the projector’s bulb achieves a lamp life of between 4,000 and 10,000 hours – which is also much better than the competition. High-Quality Data Images: The Acer S1385 is designed to deliver high-quality black-and-white data images. With a high contrast ratio of 13,000:1, as well as optimize color balance, the images are right on point, with an accurate palate, great contrast in white-on-black text, and superb crispness. Overall, image quality is great and on par with what you might find in more expensive models. Versatile Portability: Another reason this projector is a business favorite: Its size. The S1385 weighs just 5.5 pounds, and it measures about the size of a reference book. That makes it easy enough to quickly move from presentation to presentation. Additionally, the projector is designed with a short-throw lamp with a .49:1 throw ratio, making it possible to fit the image on the screen even in small conference rooms. ViewSonic PJD6683ws: The ViewSonic was recently discontinued, but it’s still available from third-party resellers. It compares closely to the S1385 in terms of brightness (3,000 lumens) and contrast (15,000:1), but it was still $100 more. Optoma GT1080: Last year, Optoma released this Full HD projector. It compares closely with the Acer in terms of price, about $700, as well as brightness and contrast, 2,800 lumens and 25,000:1 respectively. They’re very evenly matched; yet the GT1080 is more suited for video and gaming, while the S1385 is a more optimized data projector. 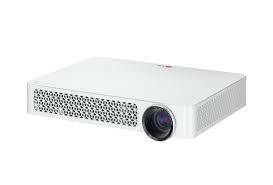 InFocus IN1146: The InFocus is an LED projector that’s rated for just 800-lumen images. Yet it does cost $100 less than Acer, and has a 30,000-hour lamp life. If you won’t be battling with ambient light, this would be a suitable option. Looking for an Acer S1385WHne replacement lamp? Shop and save on MyProjectorLamps.com. We offer the best prices on replacement projector lamps, fast shipping, and unbeatable selection. 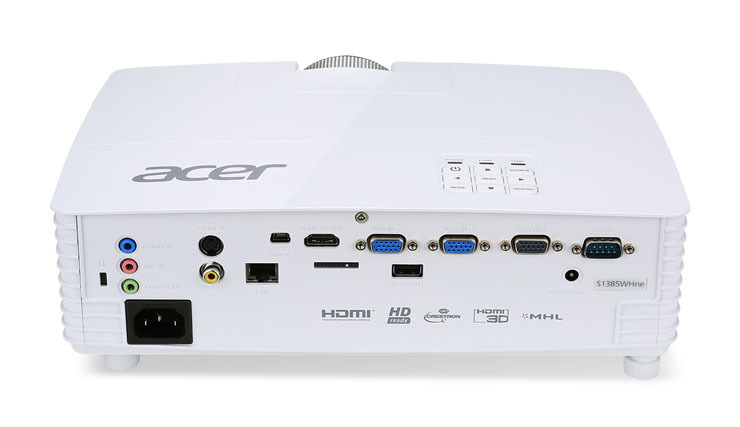 In 2011, the Acer H9500BD was one of the first 3D projectors to hit the market at a sub-$2,000 price. Thanks to its pricing, it quickly found a loyal audience of operators. But that was just one factor that made it a fast favorite. 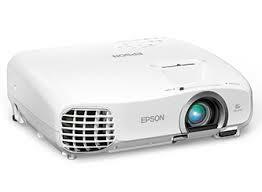 The projector was also equipped with several technologies that delivered impressive image quality. For example, the H9500BD’s dynamic iris increased the overall black levels, providing rich dark scenes. Overall, the 3D specs are fairly impressive too. The projector is capable of displaying a variety of 3D content – from Blu-ray to PC 3D – and the image quality is fairy crisp, bright and clear. Today, the projector’s specs are a little aged, as many of the components that made it unique in 2011 have become commonplace. But at the time, the H9500BD was a unique and powerful projector for 2D and 3D content. Dynamic Iris: The projector’s dynamic iris adds depth to dark images, helping to enrich black levels and clarify shadow detail. In 2011, when the projector was initially released, dynamic iris wasn’t common in $1,500 projectors. Today, it’s more of the norm. Even so, the H9500BD’s iris delivers superior performance; dark scenes are vibrant and the black levels are deep. With a 50,000:1 contrast ratio, images are also crisp and fine details are on point. Maxing out the contrast can create a soap opera effect, though, and it’s best to adjust the contrast until you reach a desired level. Accurate Color Pre-Sets: Another advantage: The H9500BD’s color performance out-of-box was near perfect. It only required slight adjustments for optimal color performance. Because of this, it’s pretty much a plug-and-play projector. Overall, the color performance is very good. Skin tones appear natural and colors are saturated and vibrant. One disadvantage: The projector’s 280-watt UHF lamp doesn’t offer long-lasting performance, starting at about 3,000 hours in normal operating mode and 4,000 hours in eco mode. Fortunately, replacement lamps for the Acer H9500BD are relatively affordable, starting around $300. MyProjectorLamps is your source for affordable, OEM-quality replacement projector lamps. We carry replacements for the Acer H9500BD. Order yours today. How does the Acer P5207b perform as a multimedia projector? On one hand, the two-year-old Acer provides satisfactory image quality in its native XGA resolution. Plus, the image is extremely bright, which makes this model perfect for large venues. The projector provides an estimated 4,000 ANSI lumens of brightness – powerful enough for spaces with modest levels of ambient light. Rated at 4,000 ANSI lumens, the biggest advantage of the DLP 3D P5207b is its brightness. Other projectors in the price range generally hover around the 3,000-lumen mark. Plus, additional image specs, including its 10,000:1 contrast ratio and native XGA resolution, which deliver a data image that’s clear, even when projected on large screens. In terms of color performance, the Acer also delivers. 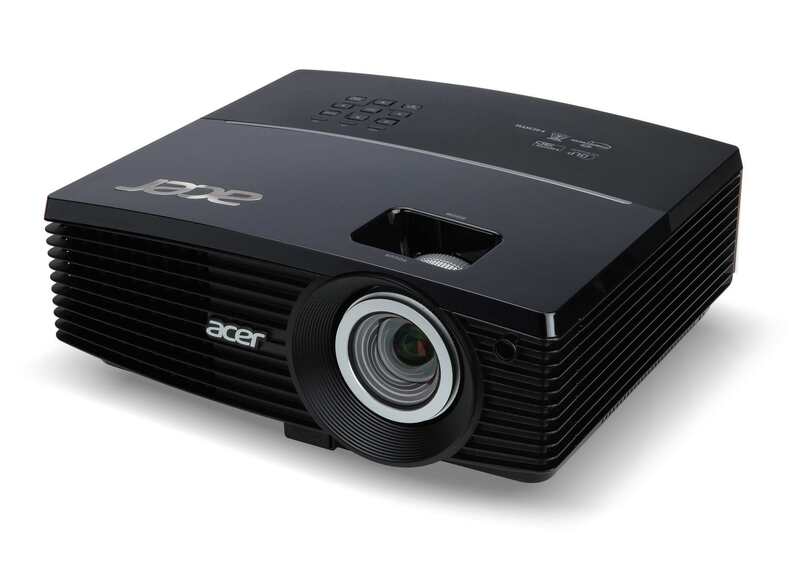 Featuring Acer’s ColorBoost II+ technology, the colors are vibrant, and compare nicely to other DLP-based projectors. The Acer P5207b is equipped with two built-in speakers, which gives the projector an advantage. 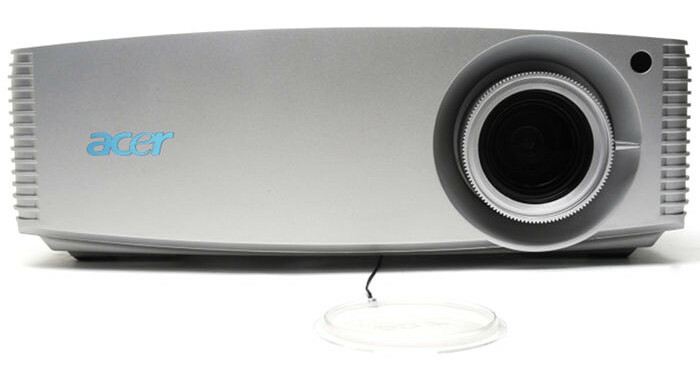 Other similarly priced projectors have either or one or two, and some require external audio. They are dual 5-watt speakers, which is substantial enough for large venues, although for the largest rooms, the speakers may require amplification. Another advantage: The Acer also has some advanced technologies that enable setup flexibility. For one, the Acer’s lens has a 1.6x optical zoom. This makes it easier to resize images to fit a screen. Plus, the projector has a superior 2x digital zoom, which enables users to zoom in on particular images. On one hand, the Acer’s bulb is fairly bright, but it also has just an average lamp life. The bulb (Replacement Part No. : MC.JG211.001) is a 280-watt OSRAM bulb. There are three settings, the normal mode, eco mode and an advanced eco mode. Lamp life for the Acer ranges from 3,000 hours (about average) up to 7,000 in its advanced eco mode. 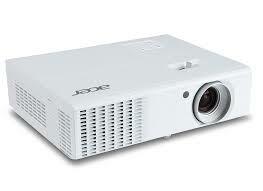 In its eco mode, though, the Acer has a 4,000-hour lamp life, which is average compared to other projectors. For presentations with short video clips, the Acer is capable yet underwhelming. Video performance is average, at best, and leaves something to be desired. Plus, in its native resolution XGA, videos aren’t crisp and clear, and although it does support higher resolutions, often video image is lost. The Verdict: Should You Buy the Acer P5207b? Starting at roughly at about $738 US, the Acer P5207B is slightly higher in price than other two-year-old projectors with similar specs. But the projector leaves something to be desired. Although it produces fairly crisp and clear images, the limited number of ports, average video performance and limited lamp life are all factors that diminish its value. Simply put, you could find better projectors for the price, however, the Acer’s brightness might be the redeeming quality that makes you go out and buy one as it definitely fills the room. Looking for an entry-level home theater projector? You’re in luck. Just a short time ago, the budget-friendly projectors sacrificed image quality, for price. If you didn’t have the budget to pay more than $1,000 for a projector, you could expect sub-par image quality and construction. The good news is that has changed. Today, there is a range of sub-$1,000 options that provide impressive image quality and that will completely enhance your home theater. So which budget-friendly projector should you choose? Really, it depends on what you’re looking for, but here are 5 projectors under $1,000 that provide excellent picture quality, solid construction, configuration flexibility, and competitive brightness. 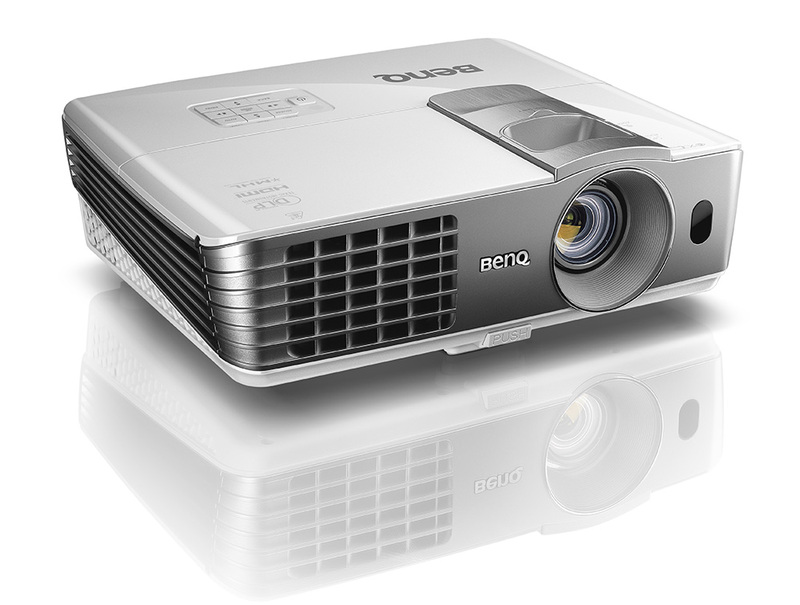 BenQ HT1075 – For years, BenQ manufactured one of the most popular sub-$1,000 home theater projectors – the W1070. Finally, they released an update last year, the HT1075. For the price, the 1075 is tough to beat, especially in terms of picture quality. The HT1075 provides crisp, detailed images with a vibrant color array and strong contrast. Plus, the HT1075 incorporates vertical and horizontal lens shift, which is a useful feature during installation. The W1070, on the other hand, remains a solid option for your home theater, as well. Optoma HD26 – Optoma is a market leader in budget-friendly projectors, and the HD26 is hands-down the best option they offer that’s less than $1,000. As far as a home theater projector, the HD26 does reasonably well, providing a bright picture even in modestly lit living rooms. Plus, the HD26 has a built-in speaker – a 10-watt mono – which makes this a great, affordable “out-of-the-box” system for your home theater. The Optoma HD141X, which is a bit more affordable than the HD26, shares many of the same features, and is another great option from Optoma. Epson PowerLite Home Cinema 2030 – Compared to the two previously mentioned projectors, the Epson 2030 is a LCD-based projector. So you won’t see any rainbow artifacts with the 2030 – which is one advantage. 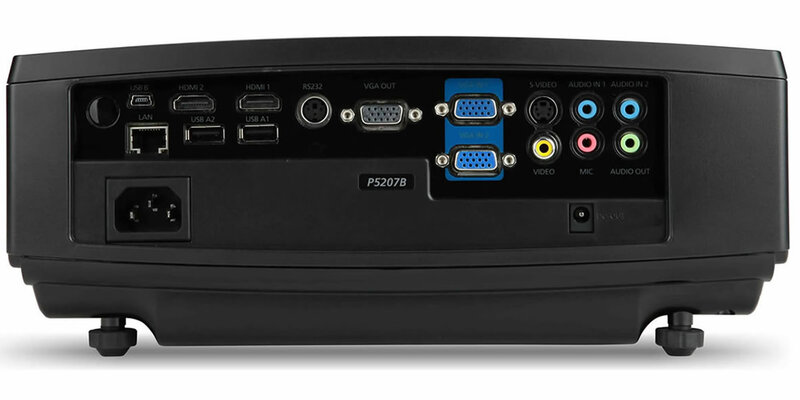 Plus, the Home Cinema 2030 is built for home entertainment – it can be used in your home theater, for gaming, or as a replacement for your TV. The biggest disadvantage: The 2030 doesn’t have lens shift, which limits your configuration options. 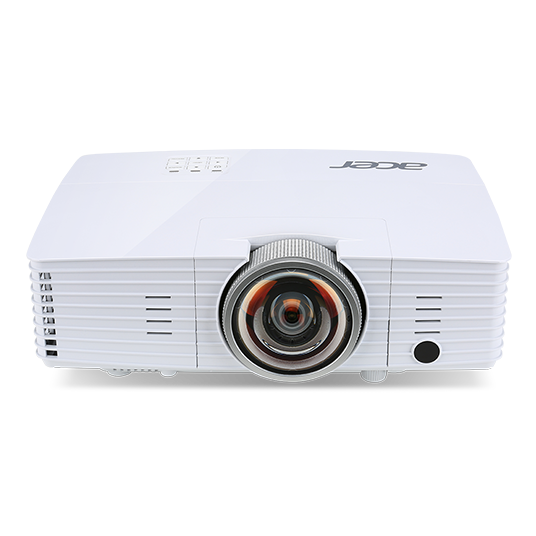 Acer H6510BD – When it was introduced in 2013, the Acer H6510BD was one of the most affordable 3D-ready projectors on the market. Now, the space is a bit more crowded, and prices on a few better performing models have dropped. Overall, the Acer performs reasonably well. The picture quality is vibrant in rooms with ambient light, but in theaters, the Acer is prone to showing rainbow artifacts. 5. LG PF85U – The LG PF85U might be the best replacement for your TV. LG bills this as a LED Smart Projector, which means it has a built-in smart TV. The LG PF85U can connect easily to web-based viewing sites like Hulu or Netflix. Also, the projector has a reasonably loud stereo sound system built-in. Where the LG falls short is in image quality. Overall, in dimly lit rooms, the LG performs well, but when more light is present, you’re likely to experience washed-out colors and less detailed images. Also, the LG isn’t 3D ready and there aren’t zoom capabilities, which are two other disadvantages. If you’re planning a home theater on the cheap, you have options available to you that will enhance your home theater. Is there a clear winner? The BenQ HT1075 is one of our favorites, but depending on the features you’re looking for, all five of these projectors offer something a little different. Plus, they’re all affordable and perform well.